This entry was posted on 27 September 2016 by Filippo Bradaschia. Telescope mount, what to choose: “Power is nothing without control”, as stated by an advertisement, applies to telescopes as well, especially in astrophotography when taking long-exposure pictures of objects that are too faint to be seen. In fact, in order to take picture of celestial objects by using telescopes, it is essential to have an automatic tracking system to capture stars apparent motion: the mount. 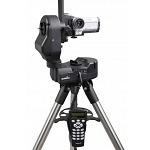 A mount is made up of a mounting head which is where the telescope is placed and allows it to move and rotate (and often electronically driven motors) and a tripod which holds up and stabilizes the telescope (thanks to three adjustable-height legs). The mount serves as a “motorized tripod” which allows us to point at the object and take a picture of it. By using motorized and computerized mounts, it is also possible to track the apparent motion (caused by Earth's rotation) of the observed object. This feature is very important in astrophotography since we can take long-exposure pictures and obtain a precise tracking. Furthermore we can observe perfectly sharp-like stars all along the captured field, thanks to systems which control and, if necessary, correct tracking errors (automatic tracking system). Because of this, it is essential to choose carefully the most suitable mount for our needs when we select an astrophotography telescope: I suggest to choose carefully the mount that even with a small optical tube can assure high-quality pictures; by using a big-sized optical tube and a small mount instead, you won't probably be able to capture satisfying images of any celestial object. Equatorial mounts are more difficult to use since they need the “polar alignment” to work properly (and this process should be carried out very carefully, because the tracking quality of the mount depends on the accuracy of the polar alignment). Furthermore, it is necessary to use heavy counter-weights in order to place the telescope. 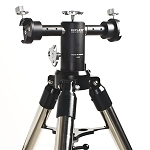 Equatorial mounts though, offer an accurate tracking of celestial objects and, therefore, are considered as the most suitable mounts and are used with amateur telescopes, in order to take long-exposure astrophotographs. The choice of the mount, depends above all on the optical tube which it has to support. In fact, various mounts offer different load capacity (namely the heaviest weight of the optical tube that a mount can carry). Mounts can offer a range of load carrying capacity from 7-8 kg (smaller mounts) to 40-50 Kg (highest-quality mounts). When we have to select the mount, we should consider that the load capacity limit is usually considered for a visual use while for a photographic one it should be divided by 2, since a perfect stability of the mount is required for astrophotography (especially while taking long-exposure astrophotos). For example, the AIRY APO80 optical tube (which weighs 3 kg), suits perfectly a HEQ5 Synscan mount, which has a 14kg load carrying capacity (namely 7kg for astrophotography). 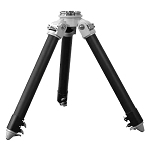 The EQ5 Synscan mount's weight (10 kg load carrying capacity; 5 kg for a photographic use) instead, it is too close to the load limit and, therefore, is not suitable for that optical tube (since several accessories such as cameras, tracking systems and photographic converters/adapters etc. are also required). It is equally important to consider the telescope's focal length and, therefore, the magnification produced by the optical tube. Obviously, a larger telescope's focal length leads to higher magnification and therefore it will be possible to capture smaller details. Higher magnification however, requires a higher tracking precision and this should be considered as well, since there are various types of equatorial mounts and they offer different tracking accuracy. Generally, commercial mounts are suitable for long-exposure astrophotography if the shooting focal length is lower than 1000mm. SkyWatcher EQ6 or SkyWatcher AZ-EQ6 are among the most used models because they can take long-exposure astrophotos using well-equipped telescopes with 1000-1200mm focal length and carry even 10-12kg loads. When the focal length is higher than 1000-1200mm it is necessary to use more precise mounts. For example, Losmandy G11 mount or Gemini G53f are great mounts which suit long focal length telescopes like Ritchey-Chretien or Dali Kirkham (such as OrionOpticsUK ODK), thanks to a very accurate tracking system. The higher cost of these mounts is one of the reason why, as said before, it is suggested to start astrophotography with an apochromatic refractor: in fact, these telescopes have usually low focal length and, therefore, they allow to use less expensive equatorial mounts. 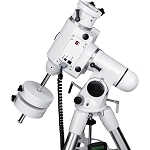 When choosing a suitable mount for a telescope, the equipment is very important. Above all, a mount should at least have the sidereal tracking motor, which is positioned on the Right Ascension axis. But, with the arrival of digital photography, this is not considered sufficient anymore to assure good quality images. Digital photography in fact allows to obtain high-resolution pictures but it requires a perfect mount tracking as well and, therefore, the mount should have a dual axis motor (Right Ascension and Declination). 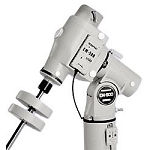 Modern telescope mounts are usually equipped also with a specific electronic system with a hand pad (such as SkyWatcher's SynScan or Celestron's NexStar+). By that, the mount can automatically point and track celestial objects. This feature allows us to easily point at objects which are too faint to be seen with naked eye (they usually “appear” after a long-exposure photo). 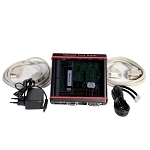 Furthermore, it also has advanced features such as autoguide port and periodic error correction (PEC). When you have to select a suitable mount for astrophotography, make sure to have these two features (which will be discussed in a following article) are available since they can assure a high tracking accuracy (which is very important in order to image deep-sky objects). 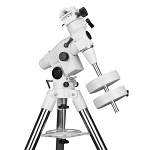 Even the most expensive and sophisticated equatorial mount can't accurately track celestial objects if not precisely aligned to the celestial Pole (a point in the sky which is very close to Polar Star in case of the Northern Hemisphere). The polar alignment of the mount should be carefully performed and verified and, in order to do it, a polar scope is used (particularly useful for long-exposure astrophotography). Make sure to have the polar telescope available or, if not possible, to have it at least as an optional accessory (we suggest to order it together with the mount in this case). Furthermore, PoleMaster (a special accessory developed by QHYCCD) is also available and can replace a standard polar scope. This allows to accurately perform the polar alignment by observing and adjusting the position of the celestial Pole on your computer screen thanks to the specific software. Finally, it is very important to consider the transportability of the mount, since they are usually quite heavy. In fact, in order to assure a perfect stability for both visual and photographic use, mounts can be not only big, but also very heavy (sometimes heavier than 30-40 kg). Because of this, a permanent/fixed installation protected by an observatory dome is preferred when using high-focal length telescopes to photograph deep-sky objects, since the telescope is not easily transportable because of the heavy mounts. More please consider that mounts of similar load capacity may have different weights and dimensions. For example, the head of the Losmandy G11 mount is smaller and lighter (head's weight is 15 Kg) than SkyWatcher EQ6 (whose head's weight is 16 kg), but, thanks to high mechanical quality, it has a better tracking precision and bigger load capacity.